LONGi Solar is a world leading manufacturer of high-efficiency mono-crystalline solar cells and modules. The Company is wholly owned by LONGi Group. LONGi Group(SH601012) is the largest supplier of mono-crystalline silicon wafers in the world, with totally assets above $1.7billion.(2016). Armed and powered by advanced technology and long standing experience of LONGi Group in the field of mono-crystalline silicon, LONGi Solar has shipped over 1GW products in 2015 and is estimated to double the revenue by the end of 2016. The company has its headquarters in Xi'an and branches in Japan, Europe, North America, India and Malaysia. With strong focus on R&D, production and sales & marketing of mono-crystalline silicon products, LONGi Solar is committed to providing the best LCOE solutions as well as promoting the worldwide adoption of mono-crystalline technology. 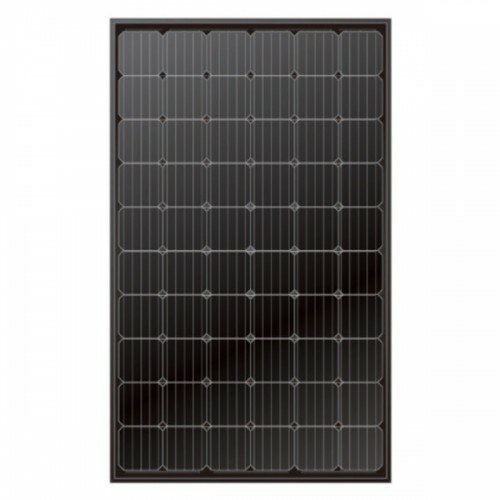 The LONGi Solar LR6-60PB-305M has a black frame and black backsheet making it ideal for residential, commercial and utility applications where aesthetic appearances are priority. The Hi-MO1 high efficiency, low LID Mono PERC cells slow power degradation and also makes this module an excellent performer in low-light irradiance environments. 0~+5W positive tolerance of maximum power guaranteed. The highest efficiency up to 18.7%. Outstanding power output in low irradiance conditions, such as dawn, dusk and cloudy days. Excellent anti-salt mist and anti-ammonia capability make these adaptable to harsh seaside environments. Great pressure resistance with the ability to bear 2400Pa wind load and 5400Pa snow load. 10-year product warranty and 25-year linear warranty. Manufactured in an ISO 9001/14001 certified facility.